But I live in New England and it's basically winter for half of the year! It rains every other day here -- how can solar be a good investment? These are all reasonable questions--after all, if you need sunlight to generate electricity, installing solar panels in a cold, rainy/snowy state might not seem like the wisest decision. It might surprise you to learn that solar panels will actually work just fine in every U.S. state, from the frozen Northeast to the rainy Pacific Northwest. Despite the fact that Boston can be buried under snow for months while the sun shines in LA, 12 years of measurements from the National Renewable Energy Laboratory show that a solar system will generate only about 16-17% less electricity in Boston than the same system in Los Angeles. But the amount of sunlight isn't the only thing that matters when it comes down to deciding whether going solar is a good decision or not: the value of the electricity generated by the solar panels and the policies your state or municipality have in place are actually more important than how much sunlight there is. While 5 kilowatts of solar would generate about 16.5% less electricity in Boston than in Los Angeles, the value of that electricity is actually only 10% less because electricity prices are higher in Massachusetts on average than in California. Let's look compare Miami, a city on the southern tip of the Sunshine State: the same solar system in both cities would generate about 10% less electricity in Boston, but the electricity is worth over 30% more because of Florida's low electricity prices, as you can see in the chart below. This is all before you then take the value of the additional incentives provided into account: Massachusetts pays solar users for electricity generated from solar. 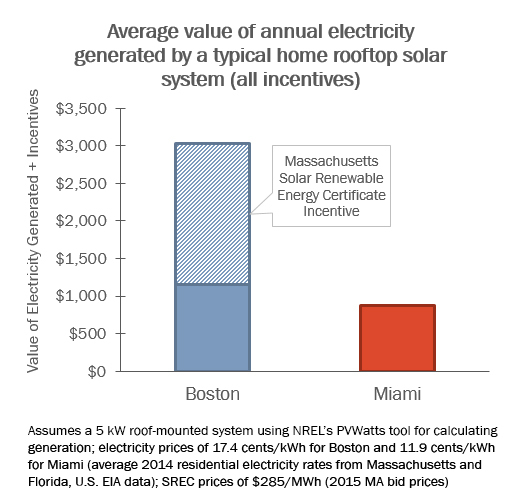 Check out the graph below and you'll see that even though there is less sun in Boston, the value of the electricity generated from the Boston solar system is over three times of that of the Miami system. This is a simplification of some of the other factors to consider, including cheaper solar panel prices in Florida than in Massachusetts, but the point is that the value of solar is more than how much sunlight you get in your area. This is reflected in the fact that Massachusetts installed nearly four times the amount of solar that Florida has in total through 2014. Fact: The global leader in solar is not California or somewhere sunny. It's Germany, whose capital, Berlin receives only two-thirds the sunlight of Boston. There's even less sunlight in Germany than in any state in the U.S. besides Alaska (and even parts of southern Alaska get more sun than parts of northern Germany! ), but high electricity prices and strong government support for solar energy has led Germany to be the global leader in solar installations by an overwhelming margin: Germany had installed nearly 40 gigawatts of solar at the end of 2014 compared to less than 20 gigawatts in the entire U.S.
As you can see from these examples, the price of electricity and the solar policies and incentives in your region have more effect on the value of your solar investment than how much sunlight your area gets. Of course, if your property gets some shade, that's another story, but counterintuitively, it is more important to look at other factors besides how much sun your state gets when making the decision to go solar! Learn more about what makes a good site for solar.